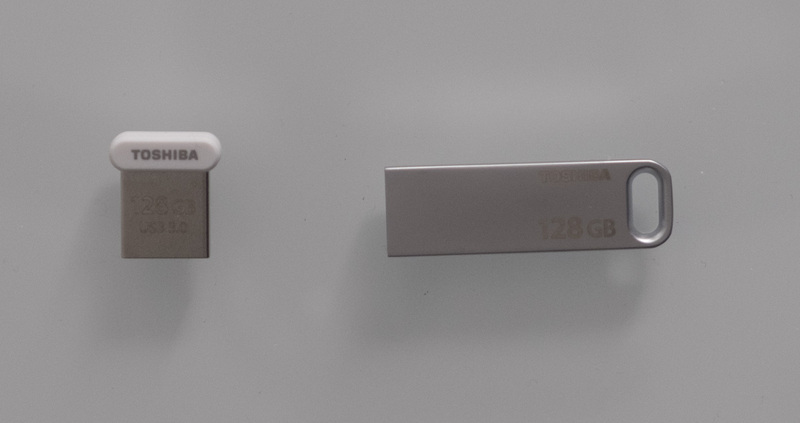 Today we’re testing the performance of two of Toshiba’s latest flash memory drives. If you’re looking for a fast 128GB drive to transport your important files, check out our review! These two drives appear to use the same speed and capacity of flash memory, differing only in their appearance. The U363 uses a slim metal body, with a small loop at the end to allow for attachment to a key ring or similar. The U364 is intended to be as small as possible, so that you can leave it permanently plugged into a laptop or another computer. Both feel well-made. Note the image above is not to scale — the image below gives a better idea of their relative sizes. In order to characterise these drives’ performance, we’ll perform a subset of our usual storage tests. The AS SSD and HD Tune Pro tests were omitted due to their overly long runtime (e.g. reaching the third stage of eight after 60 minutes). We’ll also do a simple file transfer test, counting the time it takes to read and write mixed media to the drive. Let’s begin! The drives show reasonable performance in CrystalDiskMark, with nominal differences between the two models. The drives max out just over 90 MB/s for reading and nearly 20 MB/s for writing, some distance shy of the “up to 120 MB/s” claim printed on the box. Moving to the 512KB block size results in an incremental read speed decrease, but drastically cuts write speeds. Similarly, writing many small files remains incredibly slow, even with a higher queue depth that would produce faster results in solid state drives. For flash drives, these are understandable sins, but you can certainly feel the difference between SSDs and flash memory even in USB-attached scenarios. 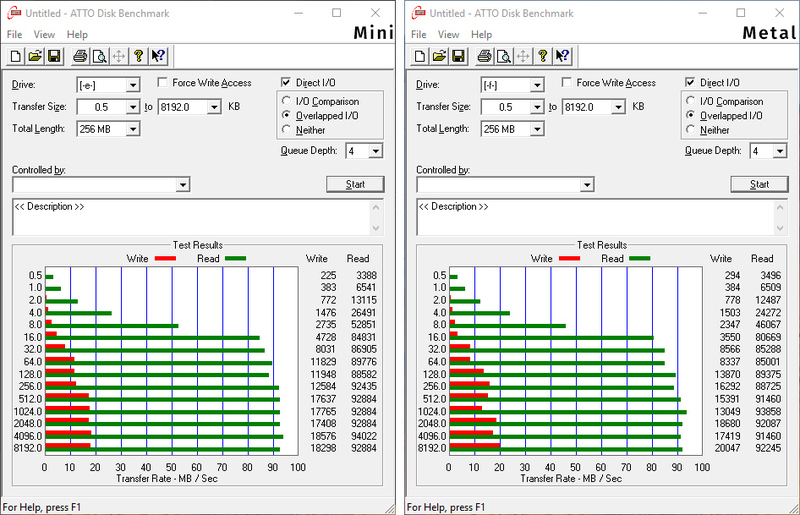 ATTO provides a comprehensive look at disk read and write speeds across a range of block sizes. We can see that the drives reach their maximum read speeds by about the 32KB size, while writing increases until about 512KB (despite some variation in the metal drive’s results). We conducted this test by copying a single 3.26GB file from a solid state drive to the flash drive we were testing, noting the time that the transfer began and ended. We then copied the file from the drive to a new location on the solid state drive, and noted the time stamps as before. With these figures and the known size of the file, the read (copying file from PC to drive) and write (copying file from drive to PC) speeds were calculated. The speeds shown here largely reflect what we saw in the synthetic tests, which is to be expected. Once again, read speeds are reasonable but write speeds are quite slow — which may try your patience when copying over large files such as HD videos, Linux .ISOs or other data. This test was conducted in a similar manner, but using a folder of 48 pictures in various formats totalling 1.02GB. The speeds here were more variable, largely due to the shorter run time (as times to only the nearest second were recorded). However, the drive didn’t show any weakness in dealing with these smaller files. The U363 and U364 drives from Toshiba offer near-identical performance, with read speeds around 80 MB/s and write speeds around 20 MB/s in our testing. That means choosing between them is all about the form factor — go for the overlooked U364 or the harder-to-lose U363. Either way, you’ll get a reasonably fast storage suitable for files little or large. If access speed is a priority, then a USB 3.0 or USB-C solid state drive is a better choice, e.g. Samsung’s T5 drive.